The Distant Mountain is a bilingual English and Hindi edition of 162 of Issa's haiku, published by Angelee Deodhar in Chandigarh, India, in 2009. English translations and comments are by David G. Lanoue, Hindi translations by Angelee Deodhar. This seasonally-arranged collection presents in book form many of Issa's haiku for the first time in languages other than Japanese. Today, Issa is a world treasure. Though his popularity in Japan persists, with new books about him appearing every year, he is becoming just as recognized and admired in other countries, as more and more translations, like the present one, are published. He is a poet who speaks to our common humanity in a way that is so honest, so contemporary, his verses might have been written this morning. Basho is the most revered of the haiku poets of Old Japan, but Issa is the most loved. 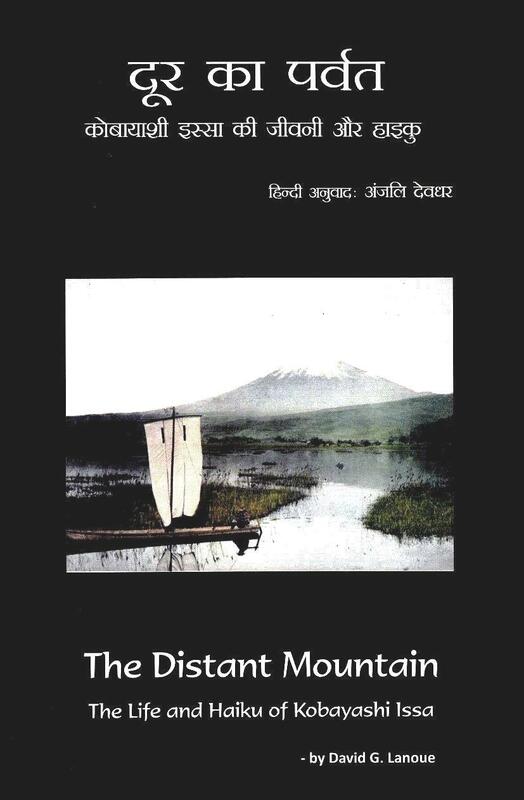 Order The Distant Mountain: The Life and Haiku of Kobayashi Issa by contacting the publisher, Angelee Deodhar, at angeleedeodhar@gmail.com ($5.00 plus $3.50 postage).